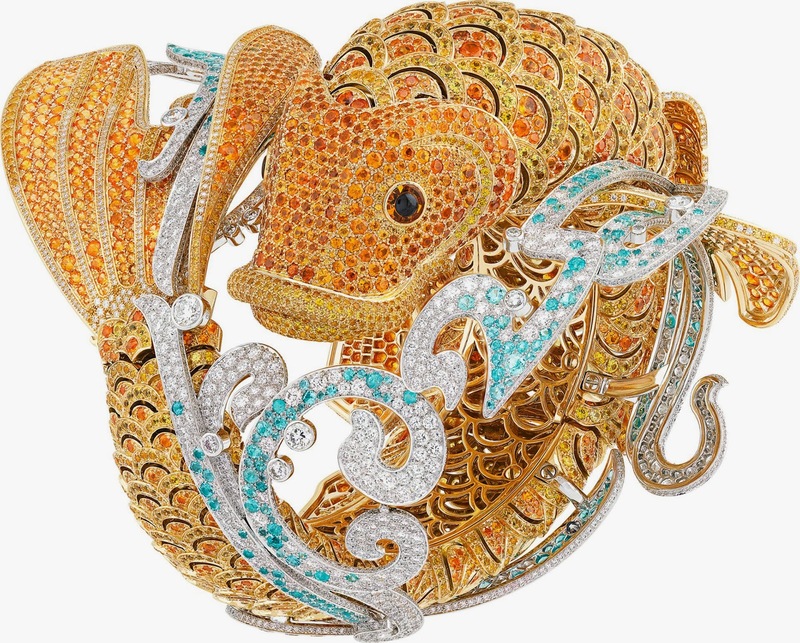 In echo to the Carpes Koï ring from the High Jewelry collection Palais de la chance™, the Carpe Koï watch bracelet gives pride of place to the theme of nature in movement that has accompanied the Maison since its very first creations. 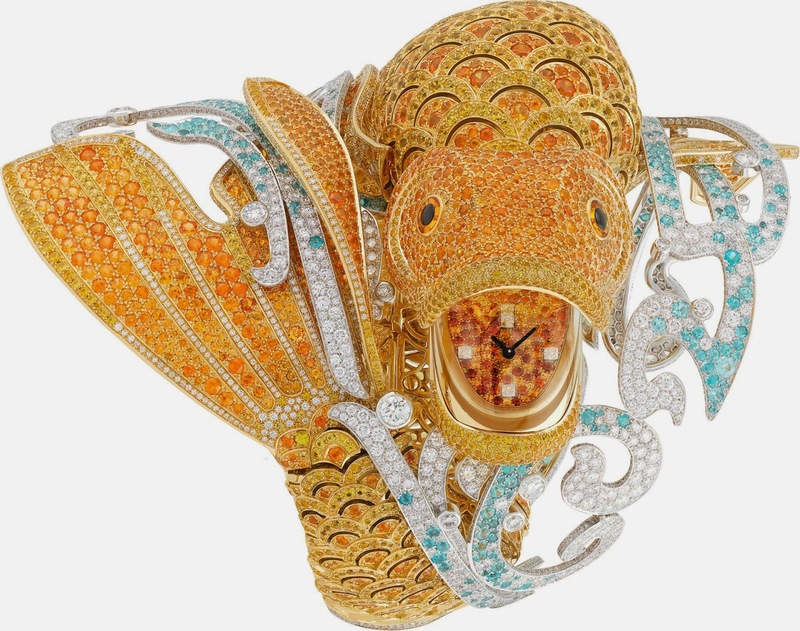 In tribute to Japanese culture, Van Cleef & Arpels presents a timepiece in the shape of a carp – the orange-colored fish with soothing properties. A symbol of love, it enlivens Zen gardens with its bright colors, contributing serenity and life. Renowned for swimming against the current, the carp is also a symbol of strength and courage. The Carpe Koï watch bracelet is a reflection of the virtuosity of the Mains d’Or™. Set with 8,000 colored stones, this unique piece called for 3450 hours of intricate work. It presents an extraordinary variety of gems, all carefully selected by Van Cleef & Arpels to meet the highest standards of quality. 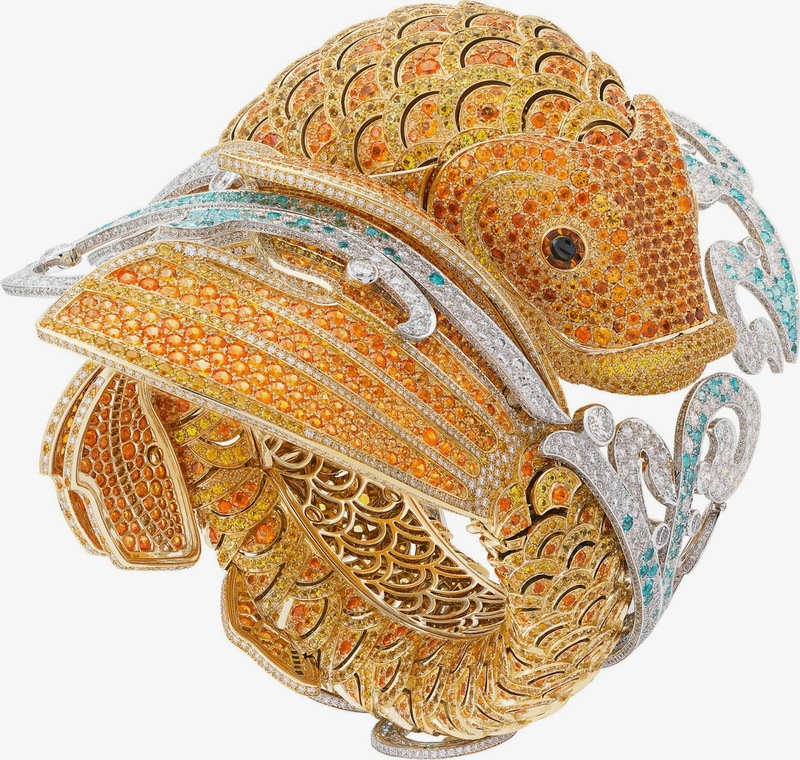 The body of the fish is adorned with yellow sapphires and spessartite garnets set on yellow gold, forming enchantingly cheerful gradations. Blue volutes of Paraíba-like tourmalines and white diamonds suggest the calm tranquility of life beneath the water. Wrapped around the wrist like a protecting talisman, the bracelet is unfastened by pressing on the carp’s tail, releasing the body. In a touch of consummate elegance, this High Jewelry timepiece displays the time with discretion: the fish’s mouth opens delicately to reveal a dial entirely set with precious stones.